Waise Lee prepares for carnage in The Big Heat. The Skinny: Routine cop thriller highlighted by some of the most insanely staged bloodshed ever. Needless to say, this is an admirable work. by Kozo: Extreme over-the-top violence permeates this grim cop action picture from Tsui Hark's Film Workshop. Absurd action reigns when cop Waise Lee decides to solve one last case to avenge his dead friend. He's Inspector Wong, an overly intense cop who suffers from nerve damage to his hand. His retirement is due, but when he discovers that an old associate has died in Malaysia, he stays on board to bring this last perp to justice. Co-directed by Johnnie To and Andrew Kam, The Big Heat is a rather conventionally plotted cop thriller that possesses many of the staples of the genre. One of Inspector Wong's partners is a rookie cop (Matthew Wong) who falls in love with an impossibly pretty nurse (Joey Wong). 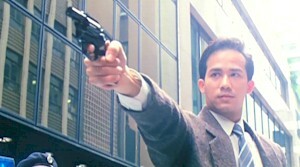 The bad guy is a ridiculously evil crime kingpin played by Paul Chu. And, nothing truly important or special happens during the course of the film. The film is populated with your standard characters and as such, most avid fans of the genre will likely have seen this stuff before. But there's action. It's not excessively frequent action, nor are the circumstances of the action inappropriate. However, when said action occurs, the movie totally changes. The police procedural stuff falls to the wayside, and the carnage that ensues is just beyond description. Blood flies, heads roll, and bones snap in just about every conceivable way as our heroes chase the fabulously evil bad guys. Everything that happens during action sequences gets turned up a notch, and results can be laughable. However, the experience can also be gleefully shocking and wildly entertaining, as the violence on display can exceed the expectations of even the most seasoned HK Cinema fan.